Throughout this series, I have never found my self particularly interested in Rehvenge. Perhaps this is due to the strategic writing of the author. She introduces us to upcoming characters, allowing us to familarize ourselves with the camaraderie that will be the mainframe throughout the novels, however she leads us to focus on the main couple at hand. With each new book, I found myself becoming completely absorbed with the main couple, enjoying them just as deeply as I enjoyed the magic of the couple I just read about in the last book. Knowing that I have this tendency, I still didn’t quite believe that I could possibly find Rehvenge’s story all that intriguing. I should have known better! I absolutely LOVED this book (and Rehvenge). Dare I say that he is perhaps my new favorite male? It ties at 2nd place after Zsadist’s and Bella’s story (first favorite being Zsadist and Bella, and 2nd favorite being Wrath and Beth’s story). The main part of the story explores Rehvenge’s life and his troubles of being half Symphath and half vampire. His honorable character (despite making his living in nefarious ways) is portrayed throughout. His loyalties towards his staff, the females of his family, and the Brotherhood are the motives for the decisions he makes. He finds himself intrigued by a female vampire nurse that works at Haven’s medical clinic (which he visits often due to his need for Dopamine, that helps keep his sociopathic “Symphath” side at bay). She is different from the usual women who surround him (the usual club goers, prostitutes, and heavily made up beauties that seem to have no depth), and her true beauty and gentle demeanor have his “exterior walls” crumbling. Ehlena was naturally lovely, with fine small features and that strawberry blonde hair and those long lean limbs. Her lips were pink because they were pink – not from some eighteen-hour, glossy, frosted grease coat. The hard edged, no nonsense Rehvenge that usually makes women uncomfortable in his presence, notices that this female could possible be returning his interest. Despite the reader (us) appreciating his noble nature, he does not realize his value, and does not feel worthy of her. He feels as dirty as the world he lives in, from his hard-edged Drug Lord career, to his deep dark secrets (including another woman that has been blackmailing him for years). He debases himself to her, simply as another way to keep his “Symphath” secret safe. His self destructive ways, along with Elehna’s need to save him, entwines them deeply, no longer allowing them to continue denying each other. Rehv’s deep voice still managed to shoot through her on a warm thrill, even though she was pissed off at him. And herself. Basically at the whole situation. She frowned. If the question had been self-pitying or accusatory, she would have just ended the call and changed her number. But there was nothing but sincere confusion coming through his voice. That and utter exhaustion. “I just don’t understand…the why,” he murmured. Other than his “mobster” side, everything about Rehvenge personifies the ideal man. Strong, loyal, loving, and non-judgemental. Like the other books of the series, this one does seem to concentrate on a main couple (their struggles and potential love, being the theme throughout). However, we get a much deeper glimpse into the lives of many of the other characters, also (seemingly foreshadowing the next novel to come). We were even afforded the luxury, many times over, of private moments between Wrath and Beth (which I adored). One of my favorite scenes in the book, actually involved a self awareness moment for Wrath, which was deeply touching. Funny, transformative events were not always scheduled and not always expected. Yeah, sure, your change turned you into a male. And when you went through the mating ceremony, you were part of a whole, no longer just yourself. And the deaths and births around you made you view the whole world differently. But every once in a while, from out of the blue, someone reaches the quiet place where you spend your private time and changes the way you see yourself. If you’re lucky it’s your mate…and the transformation reminds you once again that you are absolutely, positively with the right person: because what they say doesn’t touch you because of who they are to you, but because of the content of their message. Payne nailing him in the face woke him up. George brought him back his independence. But Beth handed him his crown. There is plenty of action in this book, that involve numerous enemies. Turmoil abounds from all angles, and love finds itself troubled, in more ways than one. From John and Xhex, to Tohr and his own personal turmoil, we personally experience their struggles. I will admit, that the ‘Lessers’ continue to bore me somewhat, however Lash does bring some interest to that side of the story, since he is not simply a mindless drone of evil, but the son of evil himself. Their constant growth and self awareness continue to strengthen these stories into a deeply woven tale, that has so much future book potential. 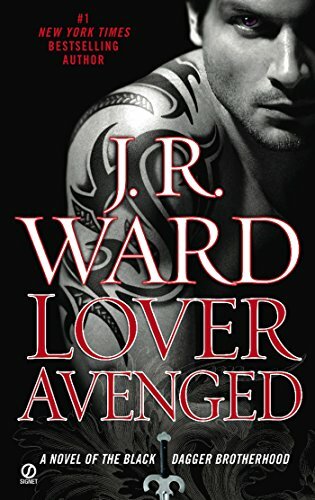 J.R. Ward has created each character lovingly. Each individual has a personality, a life of his/her own. Fears and weaknesses, triumphs, and nobilities that follow them through each installment into the next chapter of their lives. These characters truly “live” in these books. They eat “Frosted Flakes”, they wear “Keds”, they cry alone in the night, and nurse their insecurities…. they love with abandon. To read this series, is to know these characters as people. @witchy I know!! I mean, I was waiting for the book, I knew I had to read it because I was missing the Brotherhood badly, but I didn’t think I would get that attached to Rehv!! Oh I am SURE you’ll love it. Come back after you’ve read it, and let me know what you thought, ok?? I just discovered this site and am totally stoked! I got into this series once I ran out of Sookie Stackhouse novels to read. Now I like them even more! And, I’m almost in need of another author until another brotherhood book comes out. Awesome review. I, however, could not wait for this book. I began to fall for Rehv due to the way he interacted with Marisa and Bella. So he was by far my favorite male before I even started the book. Regardless, the book didn’t disappoint. I loved seeing more of the softer and more conflicted side of Rehv. I loved Ehlena’s character, too. She’s def one of my favorite females! The prior two books I didn’t feel as strongly about and this book not only delivered but I totally dug the Moors and couldn’t wait to see what further unfolded between Xhex and John Matthew. So much went on in this book! The only thing that slightly disappointed was it seemed to end rather abruptly to me. I was like “and what next?” Usually she ends with more follow up. I was expecting more about them in “Lover Mine” and they were only barely mentioned and separately. I was surprised–esp. when Doc Jane was talking so much about her nurse, V. And I was like, wait a sec… he’s only trained for field medicine, he’s not a real nurse. Ehlena is. And being one myself, I find it hard to believe that being the caretaker that she is, Ehlena isn’t needing to at least play nurse from time to time with someone else other than Rehv. ;D I was disappointed there was so little about them. Anyway, awesome blog. I’ll def stopping by again and soon! Hi Maria!! Thanks so much for letting me know you’re enjoying the blog. I adore Rehv! Unfortunately, we really don’t get much of him after his book. Bummer. I sort of wish each of our favorite characters would get two books each… even while the “full story” continues to progress. She does intend on writing a few novellas (Z got one when he became a father), Mary and Rhage will get one, and Beth and Wrath, so at least that. But I dunno, instead of following a new couple around for every new book, every once in a while, wouldn’t it be fun to have one full length that focuses on one of the past couples, again? Try Christine Feehan’s Dark series. I read that series first and was in love. Once I finished it, I was actually “lonely” while looking for something else to read. That’s when I discovered this site and the Black Dagger Brotherhood. I am very much in love with them as well. Good luck and happy reading! !